Ultrasonic images of concrete structures contain distorting components besides the desired information on relevant alterations of density and Youngs modulus. The subjective interpretation of the operator with respect to these alterations is based on the brightness information and on known morphologic aspects. It is the aim of the research work presented here to allow for an objective interpretation of the brightness distribution using statistical image processing. This is done by determining statistical quantities describing the probability of certain pixel amplitude of the ultrasonic image. In principle it doesnt play a role which type of ultrasound technique is actually used to collect the data and to put the picture together. The basic requirement for a successful application of statistical methods is the availability of a large number of reliable data resp. pixels in the case under consideration. These data are collected in the reflection techniques by scanning the accessible surface. In the following presentation the pictures under discussion had been put together by the Synthetic Aperture Focussing Technique (SAFT) using compressional ultrasound waves. In  pictures based on shear wave reflection signals are presented and interpreted making use of the same basic statistical methods. For obvious economical reasons there is a need to minimise the time per measurement at the structure. Costs are reduced and the quality of the pictures can be increased. Within the last two years remarkable progress could be observed in this field . The methods presented in the following therefore get a great importance in practical inspection technique. Mechanical waves and especially ultrasound offer the possibility to non-destructively test civil engineering structures. But due to the non-homogeneity of the material non-destructive testing of concrete is difficult for all methods based on wave propagation. Electromagnetic waves such as Radar are shielded by reinforcement and are absorbed by humid areas. Ultrasonic measurements are disturbed by scattering at random arrangements of aggregates which are constituent part of the material. Scattering at aggregates leads to grain noise and to a speckle structure in SAFT-images. Detection of objects embedded in concrete thus becomes difficult and depends more or less on subjective criteria of the operator. To fulfil the requirements of ISO 9001 an objective evaluation method has to be established. The seemingly irregular arrangement of aggregate in concrete is the result of a particular particle-size distribution and of the compacting process during manufacture. Its volume distribution can be described with the aid of statistical methods. As a consequence, noise-like ultrasonic backscatter signals generated at the aggregate can also be characterised by statistical models. The aim of the investigations presented here is to establish a more objective way for image interpretation utilising statistical image processing. The task of distinguishing obstacle indications from artefacts is formulated as a detection problem similar to methods used in radar target detection. The investigations yield to a technique which does not use any morphologic information of the signals. An algorithm is developed which adjusts a detection threshold to maintain a constant false alarm probability over the depth of the material. The value of the threshold depends on the length of the sound path and on the aggregate size distribution of the structure under test. Weibull and log-normal distributions are used to model the amplitude statistics of the received signals. In a number of controlled experiments, the dependency of the parameters of the distributions upon the properties of different concrete materials is examined. The proposed technique can be used to reduce the distortion of ultrasound images by speckle and help detecting embedded objects. It is a step towards introducing objective measures into ultrasonic testing of a material which up to date poses many difficulties on standard evaluation methods. Further enhancements are possible by including morphological information. Ultrasonic backscatter measurements consist of the radiation of an ultrasonic pulse into the structure under test and the reception of re-radiated energy. These re-radiated signals have to be processed in order to assign certain portions of the signal to the objects of interest like voids, cracks, mounting parts, or inner and outer surfaces. Grain noise may lead to images containing speckle patterns and artefacts, and it degrades the clarity of the image. Grain noise can not be removed by time averaging or matched filtering since it is correlated with the time invariant position of the aggregate. Existing methods make use of spatial averaging. The basic assumption of these strategies is the random formation of aggregates in space. Usually, echoes which exceed the noise background by more than 6 dB are regarded as significant. The existing algorithms do not meet the requirements formulated in ISO 9001: Equipment shall be used in a manner which ensures that measurement uncertainty is known and is consistent with the required measurement capability . Where appropriate, the tester shall establish procedures for identifying adequate statistical techniques required for verifying the acceptability of the test. assignment of statistical quantities to identify the uncertainty of detection of the inclusions. The basic concepts of statistical signal processing resulted in more objective statements and risk estimations in other fields of non-destructive testing, grain noise modelling, simulation, medical imaging, and radar target detection . The concept followed here is based on investigations on Gaussian noise which are modified to model non-Gaussian grain noise. 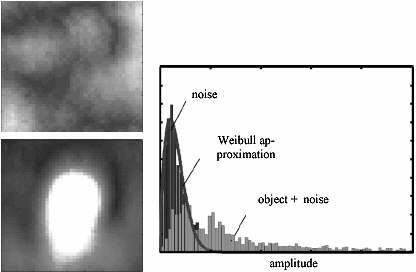 The unwanted ultrasonic echoes generated by scattering at materials non-homogeneities exhibit some similarity to thermal noise as described in the last section. For that reason the term grain noise is widely used. It is obvious that the large number of scattering interactions prevent from a deterministic examination. The statistical method used to describe thermal noise proved to be adequate for the examination of grain noise, whereas probability density functions other than Gaussian must also be taken into account. The application of Gaussian probability function as a useful first attempt for the interpretation of pictures with a low number of pixels is discussed in . Here s is the standard deviation of the logarithm of the amplitudes ve and z is their average value. To estimate the uncertainty of ultrasonic measurements in the sense of ISO 9001  the amplitude distribution of grain noise has to be known. With this knowledge an appropriate threshold value can be found and the false alarm probability can be computed. 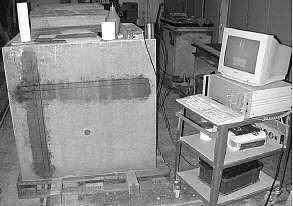 The ideas presented in the previous chapters proved to be applicable to practical problems of concrete testing, as reported in a series of publications like [5, 6]. Nevertheless it is very important to check the capabilities of the strategy explained above making use of test specimen which provide a maximum of information on the actual properties of concrete. One of the advantages of concrete is its variability in density and composition and its ease to be cast in place at low costs in nearly every form. Getting close to practical application in laboratory work usually means to provide a large number of specimens to cover the whole area. The following short summary of experimental work is only a small excerpt giving an example of results gained in a project supported by DFG . The specimens used for the investigations had been produced with a relatively large dimension to avoid scattering and reflection effects of the surfaces (see tab. 1). Three types of concrete had been produced and casted. A reliable strategy to check the capabilities of testing and interpretation techniques is the comparison between specimen without and with a well defined target. That can be performed relatively easy by drilling one or more holes into the specimen after having taken measurements. Corresponding sketches are displayed in figure 1. The same was done with all three types of specimen. The position of the hole allows to investigate three different concrete covers with respect to the axis of the hole. The diameter of the hole is similar to that of a duct used in post tensioned concrete structures. Fig 1: Specimen without (left) and with (right) a drilled hole (dimensions in cm). The measurement had been taken by a single transducer (210 kHz) reflection system. The scanning line can be seen in figure 2. Traces of the coupling by vaseline of the compressional transducers can be seen. The A-scans captured by the electronic system at the right side of figure 2 are fed to a computer applying the SAFT-algorithm and putting together the picture. In total 24 scans had been taken. Fig 2: Experimental set-up at specimen H16. Imagining the large number of possible combinations between the number of measurements and the possible statistical parameters and distribution functions it is obvious that only some characteristic examples of results can be shown here to illustrate the validity of the basic idea. The effect of a threshold defined on a statistical base can be seen in figures 3 and 4. Fig 3: SAFT-reconstruction without (upper left) and with drilled hole (lower left), histogram and Weibull approximation of the amplitude distribution (right). Only the surrounding of the drilled hole is shown to highlight the effect. It should be mentioned that the function displaying the amplitude distribution of noise enveloped by a Weibull distribution can only be separated from the part of the distribution including the effect of scattering at the hole under observation because measurements had been taken before the hole was produced. In general it is not possible to get any information about the characteristic of the noise exactly at the position of a strong scatterer of interest, because its amplitudes by far exceed those of the noise . A way out of this dilemma is to use the neighbourhood of the scatterer as a sample for a statistical approach, assuming a relatively small variation of the corresponding statistical parameters. Other strategies had been tested out in detail for example the use of statistics calculated for each line of the picture. At one hand side a certain dependency concerning the shape of scatterers (parallel to line or perpendicular in the case of drilled holes) is obvious. At the other side there are interesting possibilities offering a method to successfully suppress the effect of attenuation of sound passing the concrete. These aspects are discussed in . 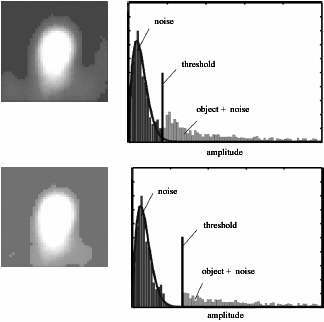 Fig 4: Threshold definition for false alarm probability of 1 % (upper diagram) and 0,01 % (lower diagram), corresponding resulting pictures displayed on the left. It was shown that ultrasound images for non-destructive concrete testing can be evaluated by statistical image processing. The tests described are part of experiments performed in an ongoing research project. Further work is in progress to make the statements of the operator more objective. It is the aim of the investigations to calculate a statistical measure for the decision whether the amplitude patterns of the image belong to an object which usually in practical applications of ultrasound is a defect, a backwall or for example a duct. The models used have to be adapted to give a better description of the material backscatter characteristics. For there are promising developments in the field of transducers, electronics and computation leading to a large amount of data , the methods described are of great future importance. ISO 9001 / EN 29001: Quality systems Model for Quality assurance in design / development, production, installing and servicing.